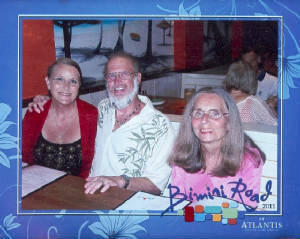 Our 24/7 family staff consists of the owner/operator/founder Kay, her husband Larry and her best friend Barbara. Kay had met Barbara Byerly through the world of showing Afghan Hounds and they became friends. In 1997 Barbara joined the Pet Tailor Family as a Groomer trainee. A few years later she started helping out with the pick up / delivery of our grooming pets and then moved to the farm to help with all the critters. She has become a real blessing to everyone. In 2008 we were blessed to have the very talented Certified Pet Stylist Lora join our staff. Before Larry and Kay met, their pet and woodworking related businesses were doing great but their private lives had become a mess. It was Christmas time and the season when Christians celebrate God’s graceful gift of the savior’s birth, by giving gifts to each other. They felt sad in the happiest season of the year and each turned to God for help. Both of them wanted God’s will above all and knew that being alone was ok if God would grant them the ability to handle it. On Christmas night they met but it was some time before they learned that they had each prayed the same type prayer to God and He had answered it by giving them the gift of each other to help them grow in His Love. They were married 4 years later. 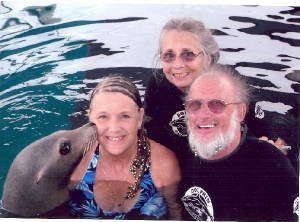 Larry and Kay on vacation; Beachcombing, Scuba Diving, Playing ball with the natives, visiting the animals of the Caribbean and acting like a birdbrain. I was raised in Norfolk Virginia by my grandparents from the time I was 9 months old. It was an active Christian home and I received lots of love but being a child of divorced parents was frowned on in the community. During elementary school I was picked on because I was bigger than the other kids and was living with older Grandparents. Feeling like I did not fit in with anyone, I became a loner. I witnessed prayer removed from school, the teaching of an evolution theory taught in school like fact and The Bible being removed from any truth in school teaching. I remember Middle School and the freedom issues, the sexual revolution, flower power and drugs. I was a very rebellious child and at the age of 15 I married and moved to Florida against my family’s advice. It would be a couple years before I returned to Virginia, now hardened by lessons learned in the world. At this point in my life I saw religious people as weak and helpless and I saw myself as tough enough to handle the fact that life was just a gamble. I remembered contradictions between what I saw and what was taught from the Bible in my youth and set out to prove that the Christian religion was a fraud. I started out thinking that it was either written by educated men to help control the weaker or by superstitious men to make them feel better about the subject of death. In 1977 I could no longer run from the question, what if I was wrong and the God talked about in the Bible was real? I figured I could settle this question once and for all if I could prove that the Bible was not the inspired word of God. I started digging into the facts of history for proof. Well, to make a long story short, I ended up proving to myself that the Bible is true. I then cried out to God for forgiveness and help. Slowly but surely I started to change from the inside out. Things did not always go smoothly but I continued to learn and my faith grew stronger. I witnessed many miracles after that and saw too many things to list here. I testify that I am thankful for the Truth of God’s Love and the Grace of Jesus Christ. It is my hope that others will seek the truth and experience the comfort of the Holy Spirit in their lives.